Organic Selections conditioner has been formulated to have a balancing effect on your hair, returning it to its naturally healthy condition. Blended to provide a natural hair and scalp tonic. 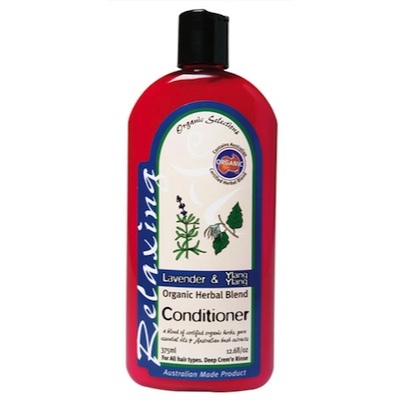 After shampooing apply a small quantity of conditioner to hair, leave for a minute and then gently rinse away. Purified Water, Certified Organic Botanical Blend of Lavender, Burdock, Rosehip, Chamomile, Horsetail (herb), Marigold; Organic Safflower Oil, Biodynamic Avocado Oil, Biodynamic Macadamia Oil, Grapefruit Seed Extract, Australian Bush Extracts of Kakadu Plum Cetyl Stearyl Alcohol, Wheatgerm Oil, Aloe Vera, Olive Leaf Extract, Potassium Sorbate, Glycerin, Guar Gum, Citrus Seed Extract, Soy Lecithin, Cetyl Alcohol, Organic Locust Bean Gum, Vitamin E, Lavender Essential Oil, Ylang Ylang Essential Oil.